Topper Industrial now offers hand operated disc brakes as an option on their four wheel and six wheel heavy duty carts. The disc brakes are used to help stop the cart and also, function as a parking brake while the cart is being loaded or as needed at the assembly line. The carts come equipped with a hand lever that operates the disc brakes when the operator pulls back in a squeezing motion on the hand lever. The hand lever requires minimal force and the hand operated disc brakes stop the cart very effectively. To engage the disc brake as a parking brake, the operator pushes the hand lever forward. 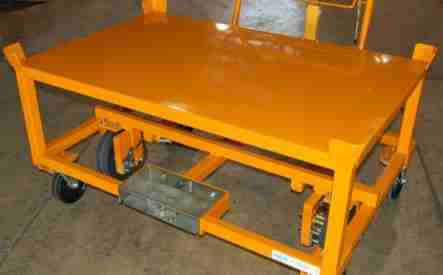 The cart is held in place without the presence of a standard foot brake. Topper Industrial is a manufacturer of ergonomically designed material handling equipment such as industrial carts, containers, conveyors, lift/tilts and racks (www.topperindustrial.com).